In her legendary signature style, Jane Davis Doggett has designed a commemorative tie for Florida’s 500th anniversary. 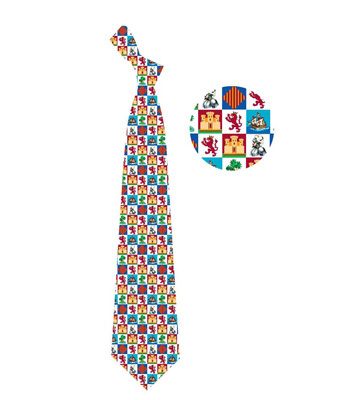 This 100% silk tie captures the visual representation of Florida’s past 500 years and its nod to the ever-present Spanish influence, with its eye-catching colors and symbols from the Spanish coat of arms, portraying the modern world and the memory of the Old World. Jane Davis Doggett attended the Yale School of Art and Architecture in the 1950s and studied graphic design and architecture to broaden her world of inspiration. She is one of the pioneering female graphic designers in the world and is the creator of the airport way finders.